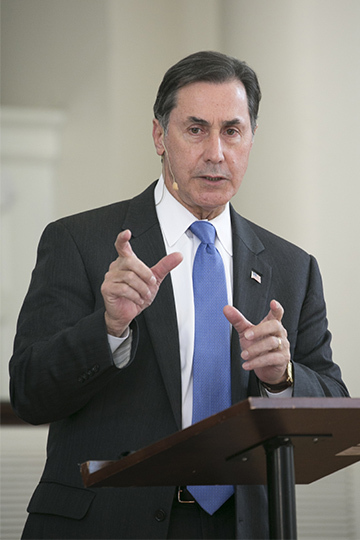 U.S. Rep. Gary Palmer addressed Samford University’s McWhorter School of Pharmacy students and faculty for the school’s annual policy and advocacy lecture Jan. 29 in Samford’s Reid Chapel. The discussion focused on national health-care reform. Palmer outlined a proposed plan to repeal the Affordable Care Act and to implement an individual health savings account program with incentives for healthy living and opportunities to reduce administrative cost through cash transactions. Palmer also emphasized a need for malpractice reform in order to restore the physician-patient relationship and improve patient outcomes. “Congressman Palmer’s remarks challenged our students to better understand the evolving health-care environment,” said pharmacy dean Michael A. Crouch. “Students gained a broader perspective of health-care reform and learned more about proposed national legislation,” added Crouch. Palmer is a cosponsor of H.R. 592, the Pharmacy and Medically Underserved Areas Enhancement Act, which would amend the Social Security Act to cover pharmacist’s professional services. According to Michael D. Hogue, professor and chair of the Department of Pharmacy Practice, H.R. 592 is a key piece of federal legislation important to the pharmacy profession. “We’re grateful for Congressman Palmer’s support of the pharmacist’s ability to practice at the full scope of our license,” said Hogue. “The passing of H.R. 592 will allow pharmacists in Alabama to address the needs of our state’s medically underserved,” he added.